I will not say that this happened, this is merely a hypothesis. If it had happened, if it had happened that close on a dozen girls had skinny dipped in the lake, in a place remarkably close to the centre of a seaside town… if they had, they might have found that the cover of darkness is quite exceptional, the bright lights being all around, but not actually in that place. If they had, there would only have been the squealing of delight to give them away. They would have been invisible, but not, it is true, inaudible. But the Outside is a big place, and giggling would have carried only so far. The Outside is good for swimming. 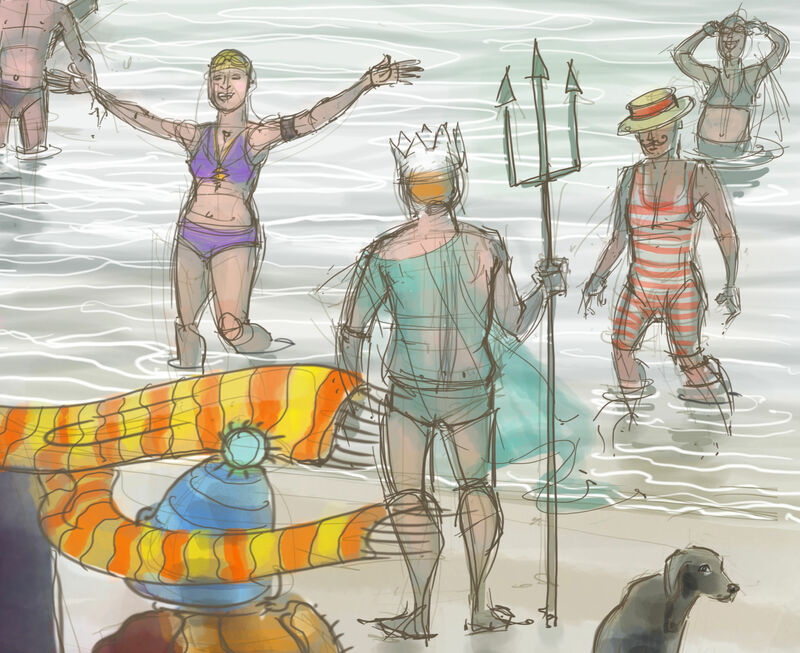 If they had swum there. Hypothetically. 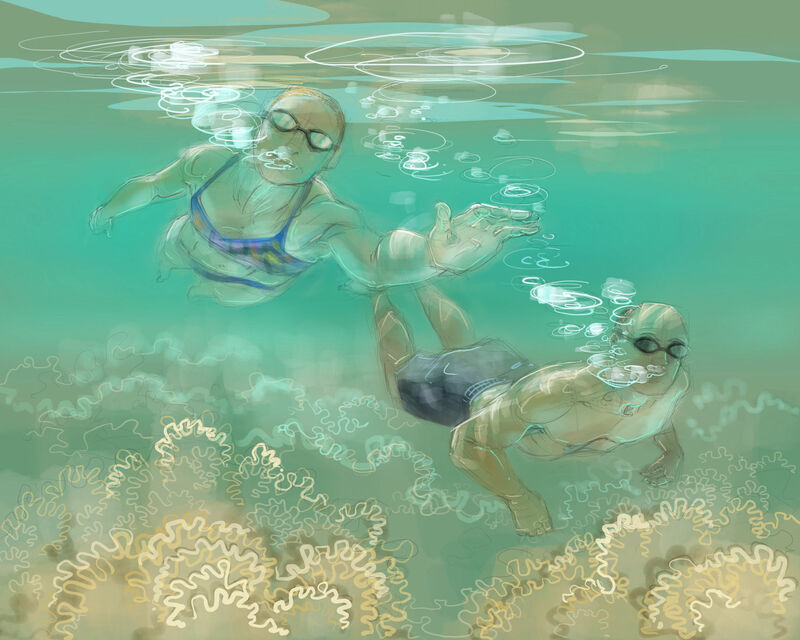 This entry was posted in digital, swimming and tagged art, drawing, Nancy Farmer, skinny dipping, swimming on April 9, 2019 by Nancy Farmer. Little commission I completed a few weeks ago – a digital drawing. And yes, you can ask me to match your wallpaper / paintwork as Sophia did, as long as you can send me a sample of the colour. Just saying this, as sometimes I think people are worried about getting a stroppy reply if they ask a question like that. If you do, find someone else to ask…. Changing a brief half way thorough is another matter we needn’t go into here (because this was not the case!). 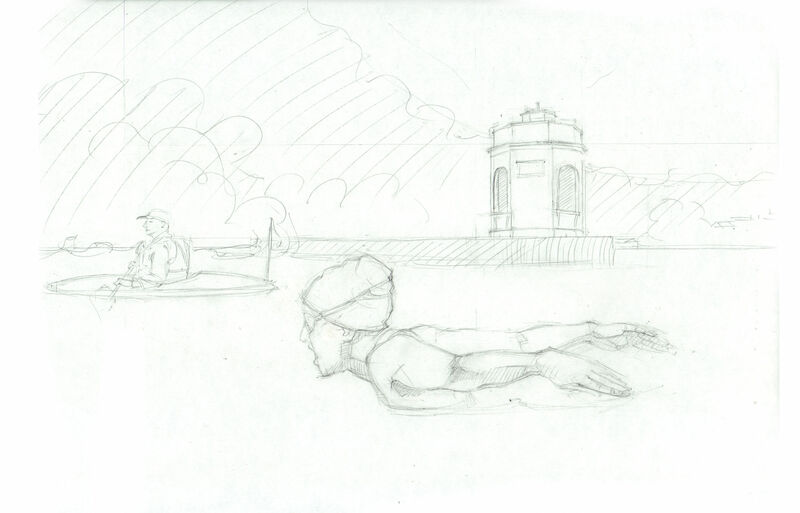 This was a lovely drawing to do, helped in part because of the natural grace in the initial photos I worked from. 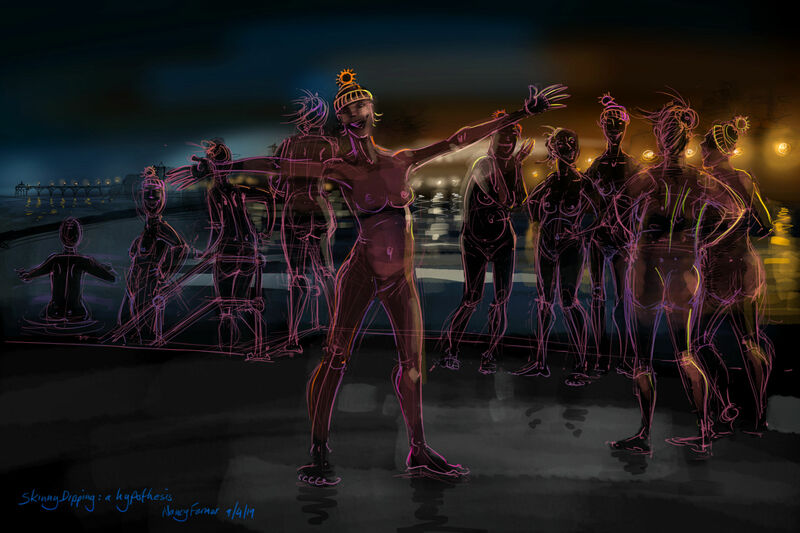 This entry was posted in commissions, digital, swimming and tagged art, commission, digital drawing, open water swimming, swimming on April 4, 2019 by Nancy Farmer. It was a little breezy down at Clevedon Beach this morning. Not as bad as it had been yesterday: a couple of floating trees, a bent iron bar on the beach and multiple heaps of seaweed up on the road above the sea wall bore witness to the weekend weather, but still, the water had that washing machine look to it. And it was a chill wind. Of course the company, coffee and cake was worth the journey on its own. Especially the company, and being nice and dry and able to enjoy watching the shrieking! 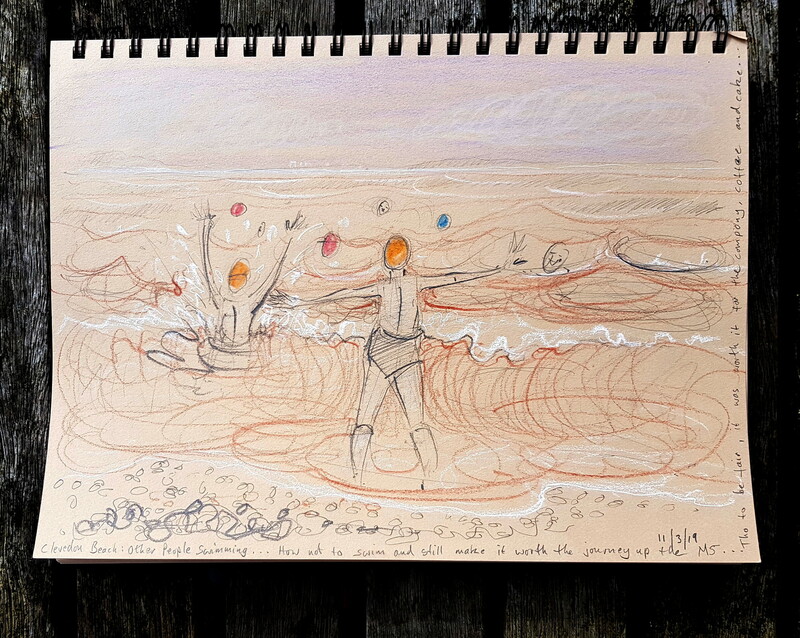 This entry was posted in drawing, pencil, Sketchbook, swimming and tagged art, Bristol Channel, Clevedon, Clevedon beach, Nancy Farmer, outdoor swimmers, outdoor swimming, Sketchbook on March 11, 2019 by Nancy Farmer. 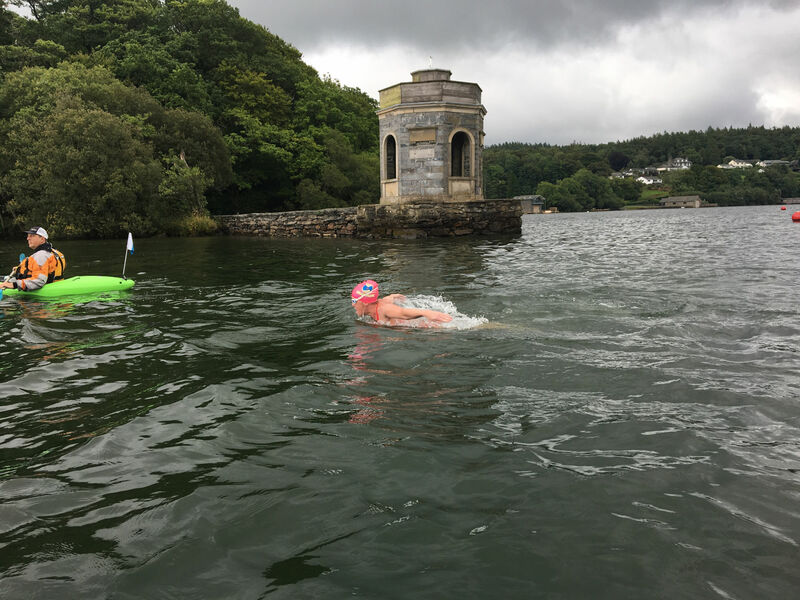 I’m an artist: I’m not obliged to be politically correct, or even accurate, but there is a difference between girls and boys when it comes to cold water swimming. There is one thing that girls are so much better at. Faffing. 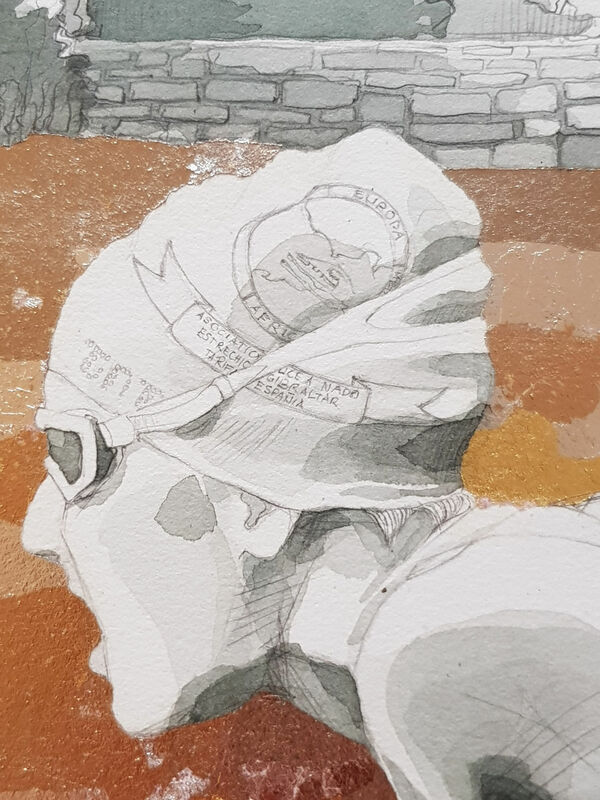 People ask me why there aren’t many pictures of men in my paintings, there aren’t actually many of the male persuasion in our group, it is true, but another of the reasons for it is they simply aren’t there. We’ve no sooner arrived at our lake, said hello, caught up on the week, the weather, measured the temperature of the water, discussed the possibility of wearing gloves or not wearing gloves, admired a new bobble hat or two, a bikini, somebody’s homemade cake, repeated the water temperature to newcomers, compared the readings on a couple of auxiliary thermometers, discussed the water temperature with those leaving the vicinity and shared a couple of hilarious stories about pants…. and we look up and find that the boys have just got in and started swimming! There they are, half way to the other side of the lake. And we have so far succeeded in removing our bobble hats and locating our cossies. If we are organized. So now you know. One thing boys aren’t very good at. This is Chris on the steps and Andy, already swimming. Andy was last year’s oldest person to swim the English Channel, solo, and he probably didn’t stop to swap stories about pants even then. 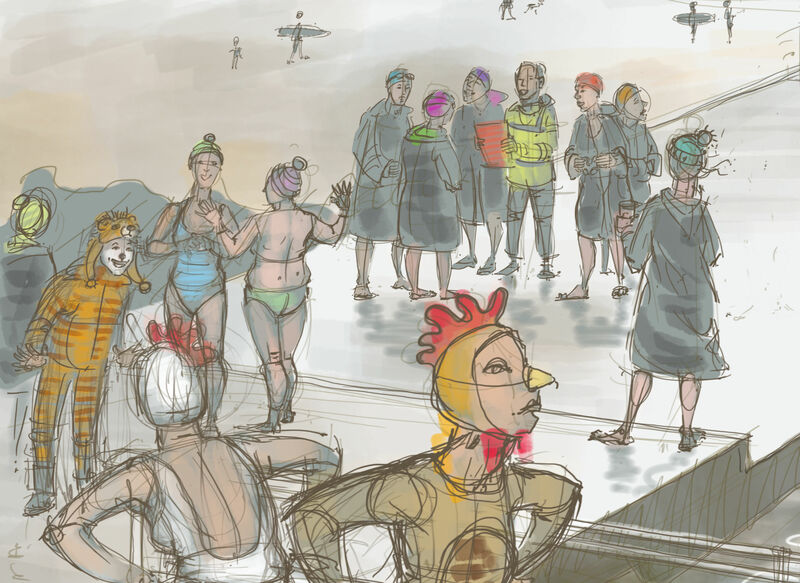 This entry was posted in digital, swimming and tagged art, art by Nancy Farmer, Clevedon Marine Lake, cold water swimming, digital drawing, drawing, faffing, men & women, Nancy Farmer, open water swimming on February 20, 2019 by Nancy Farmer. Thought you might like to see a painting I finished before Christmas. 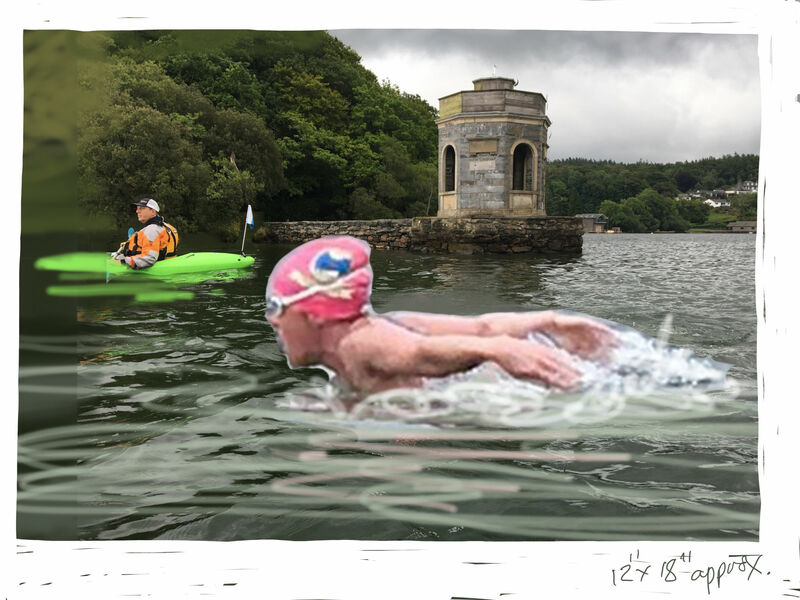 Last year, Helen Betley swam the length of Windermere… butterfly! 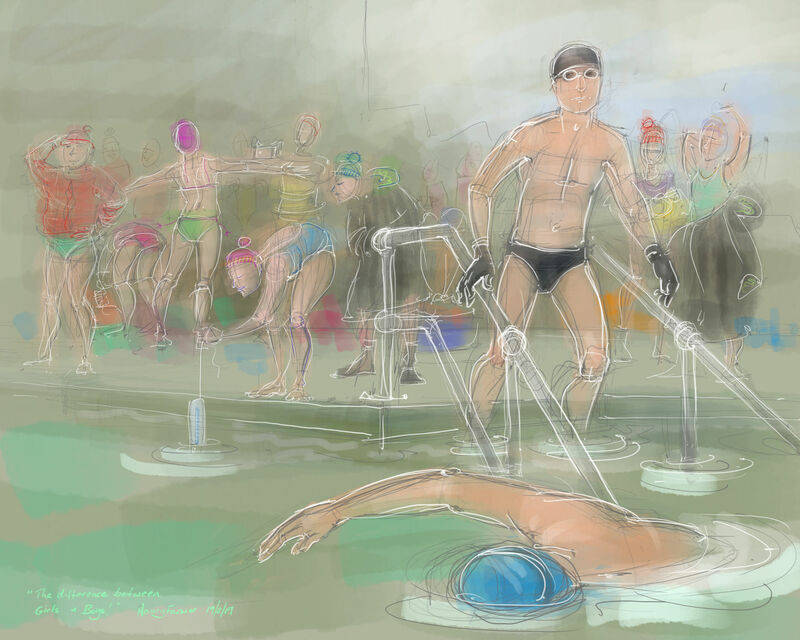 Her husband asked if I could paint a painting of the swim. 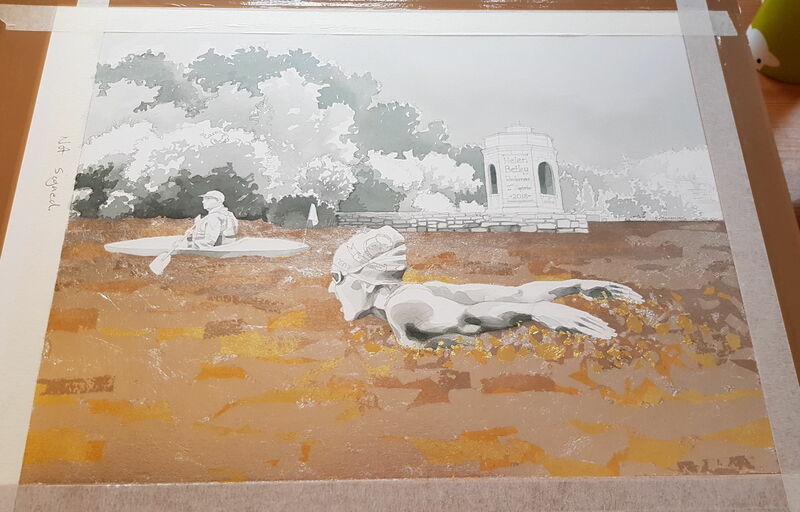 I don’t generally do landscape paintings, (as actual paintings, rather than digital drawings) but I do do a lot of figure drawings, and gold leaf, so I suggested this combination as a bold composition, rather than a straight painting of someone swimming. 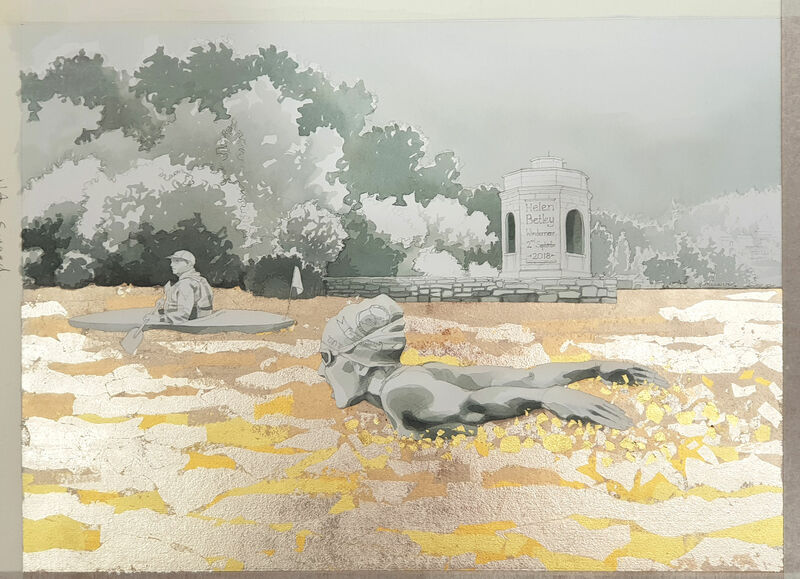 All the leaf is gold, the different colours are different alloys of gold, and it’s all applied piece by piece, with a paintbrush as it’s too delicate to pick up. 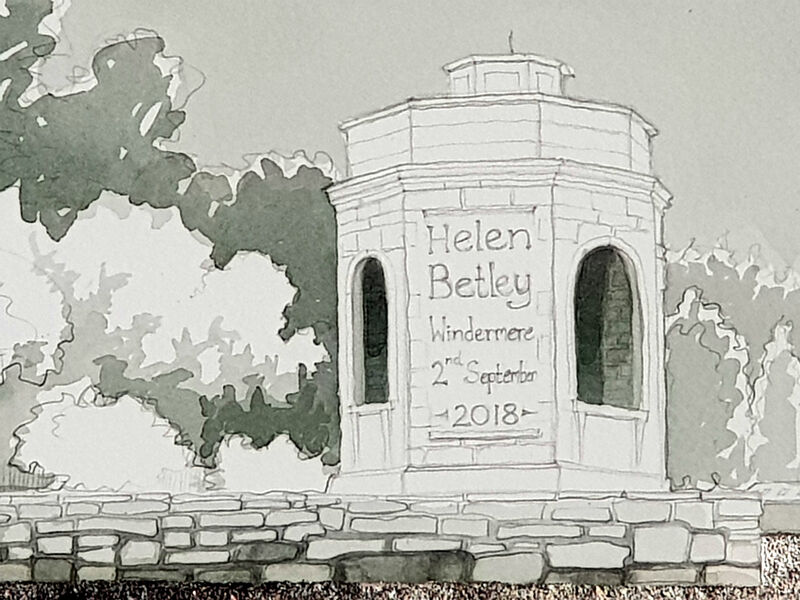 The rest is pencil and a watercolour wash, and the little folly is really there on the shore of Windermere, but I added the inscription in my drawing, as a detail to commemorate the swim. 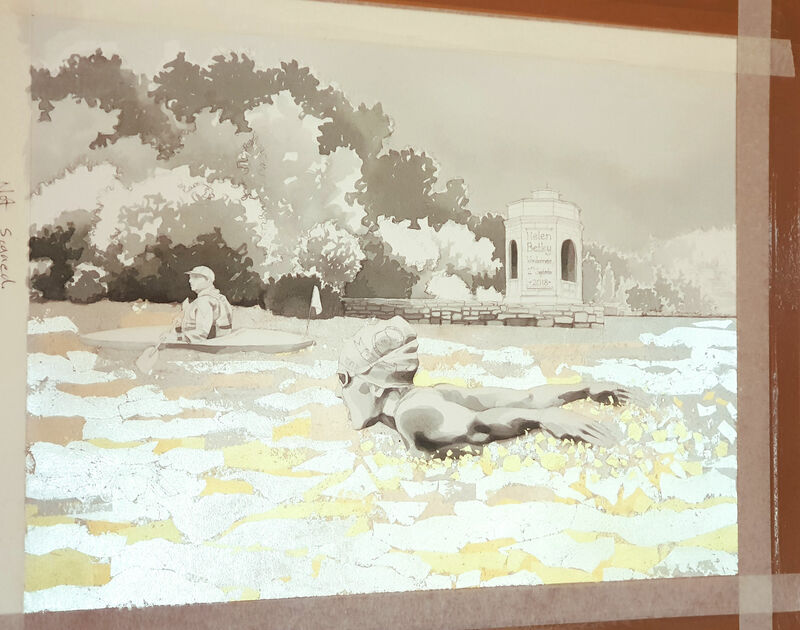 All the photographs are of the same painting – the gold leaf changes so much with different light you may think there is more than one version. 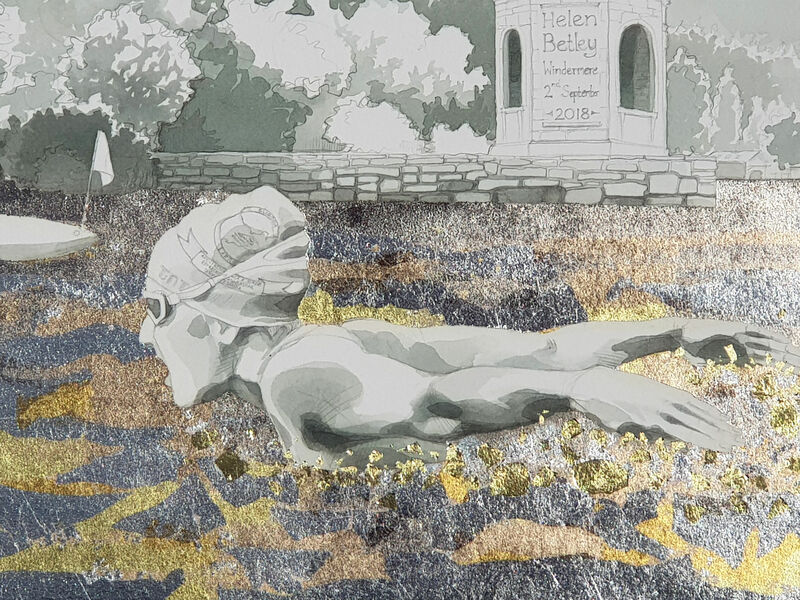 This entry was posted in commissions, drawing, Metal leaf, swimming and tagged commission, gold leaf on paper, Helen Betley, Nancy Farmer, painting, swimmer painting, swimming butterfly, Windermere on February 13, 2019 by Nancy Farmer. I’m not sure how it happened but this picture never made it onto my blog. It’s been on my Facebook page, because I donated it to the Friends of Bude Sea Pool to sell as prints (and also perhaps cards, t-shirts or whatever they want to use it for)… but somehow in the excitement it missed the blog. 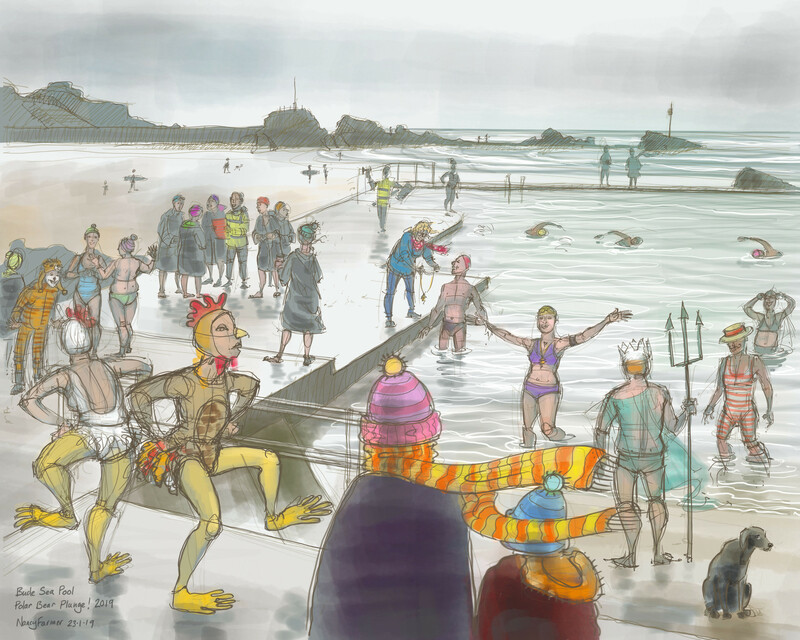 If you’d like a print, which are lovely gallery-quality prints like my others, it is available from the Friends of Bude Sea Pool website: https://www.budeseapool.org/shop/ and available from the shop in the Summerleaze Car Park. Prints: £25, £35, £60 for print alone, mounted, or framed respectively. So if you are longing for a glimpse of summer, this is the print for you! With the temperature in the high twenties and no air con in the car, Lucy and I drive down to Bude to visit the Sea Pool there. 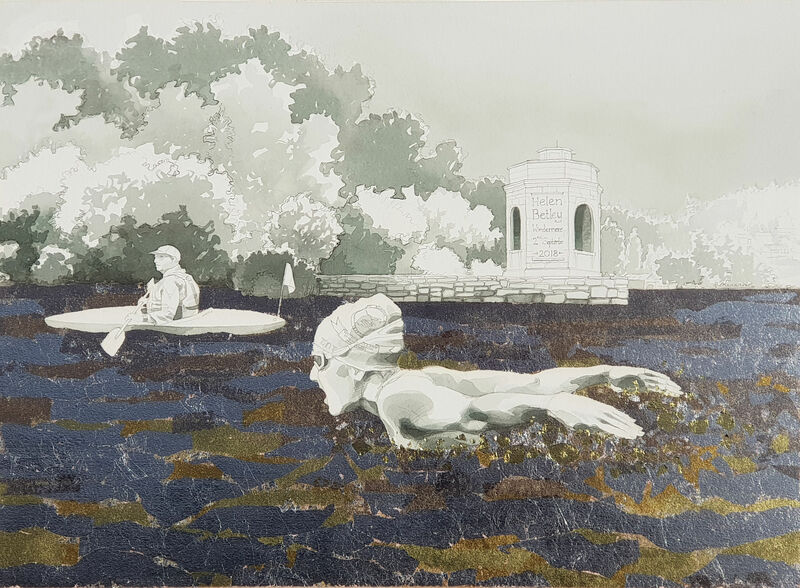 It’s a year in which we actually seem to be having Summer, and of course it’s too hot, because this is England, we are not used to this sort of weather and we weren’t expecting it. Now we can watch the antics and faffing of the great British Public, who haven’t had the opportunity to practice their waterside faffing skills since last summer. Some jump straight in it’s so hot. 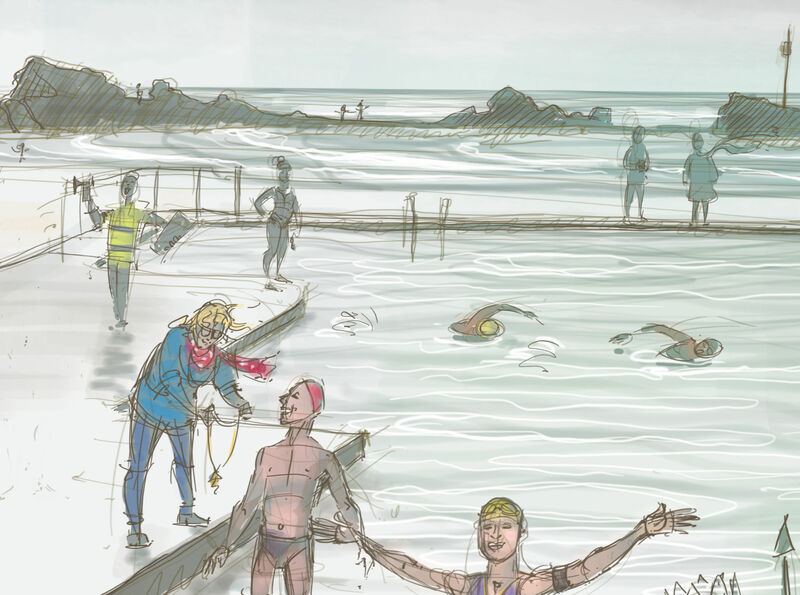 But we are pros at this: there is much talking, there are local swimmers to meet, there is the history of the rescuing of Bude Sea Pool from threatened demolition: it takes us nearly an hour to get into the water. It’s so, so lovely once you’re in! 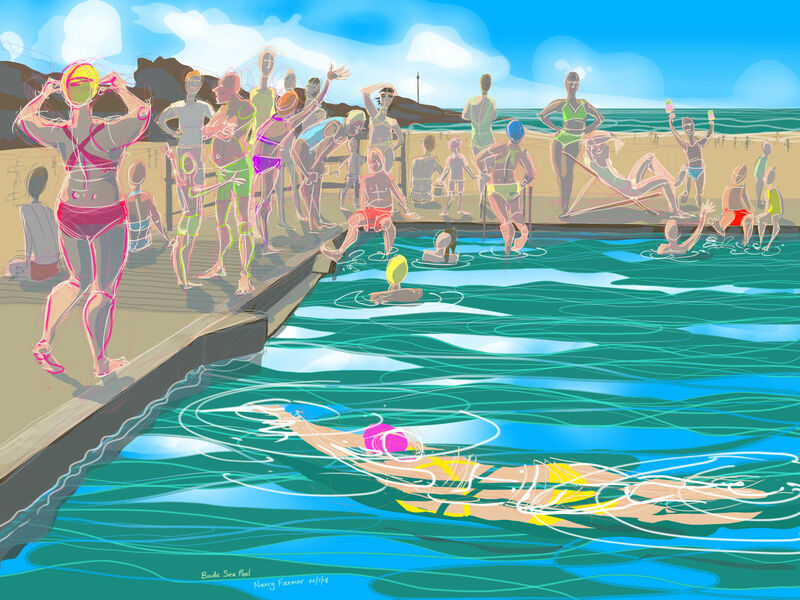 This entry was posted in commissions, digital, Places, swimming and tagged Bude Sea Pool, Cornwall, Ditgital drawing, Friends of Bude Sea Pool, Nancy Farmer, outdoor swimming on January 31, 2019 by Nancy Farmer.